Possibly the most awesome cookbook ever. I'm a nostalgic person, and have been for as long as I can remember. Here's my brand of nostalgia: I love family traditions (mine and everyone else's), retro 80s commercials, antiques (but strangely have never been antiquing), and old movies, and old music. Really old music. On my XM/Sirius lineup I have 80s on 8, 90s on 9, The Blend for harmless Pop music, The Spectrum (my favorite), Margaritaville (second favorite), and um, 40s on 4. And I actually listen to 40s on 4 quite a bit, much to the delight of my husband (he loves mocking me for this). In fact, if you asked him, I'm pretty sure he would say that I'm the most nostalgic person he knows. However, I would like to disclaim that I don't actually wish I lived back then. I don't wear clothes from that era, and I don't really think it was any better than it is today. Frankly that's a good thing because back then women wore hats a lot, and the truth is I look really goofy in hats. 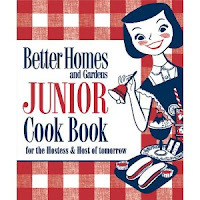 All of this leads me to this: The Better Homes and Gardens Junior Cook Book, circa 1955. This was my mother's first cookbook, and when I was a kid, I used to love to peruse its pages. Oh hell, I still love to peruse its pages! It's literally falling apart, but it's so happy. And bright. 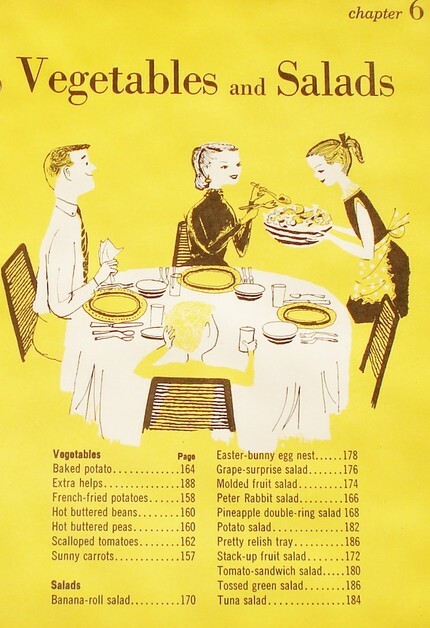 There are delightful drawings of young cooks (both male and female, though it does skew towards girls), and the real photos of kids look so...50s. There's no other way to describe it. They look like they're having the time of their little lives, and not at all demented, like some 50s photos can come across. It's broken into sections of beverages, breads and sandwiches, candy and cookies, desserts, main dishes, and vegetables and salads. Most of the recipes are really great and fun (I'm not a fan of the Saucy Spaghetti in which you mix canned spaghetti with canned sausages). They're all very to easy to follow, with minimal ingredients. It's the perfect starter cookbook for a kid. In fact, the very first recipe I ever made without anyone helping me at all was from this cookbook. I had made cookies with my mom plenty of times, but on her suggestion, I got it into my head that I really wanted to make something on my own, with no one's help or intervention. I made the Apple Crisp, which took just 5 ingredients. I remember being terrified the entire time, worried that I was screwing some part of it up, but determined to make it great. It turned out really well, and I know that it launched my love of baking. 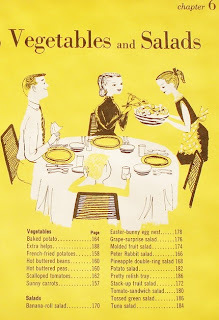 Though I was totally baffled at their advice that "Your Dad will flash you a pleased grin if you give him a wedge of his favorite cheese to eat with this dessert." I'm pretty sure my Dad was equally baffled when I handed him a slice of pre-wrapped American cheddar with his plate. Regardless, I was thrilled when my mom gave me this book to keep a few weeks ago. It was like greeting an old friend, and I was just as charmed now as I was back then. I can't wait for the day when Liam and the girls can read, and we can make the recipes together from this book. I hope it holds up until then, and maybe one day I can pass it on to them. With any kind of luck, one out of the three of them will geek out with nostalgic love just as I did.